There are many television shows today that feature glowing, eager (and sometimes quite pushy!) brides recounting their lifelong dreams of the perfect fairytale wedding. Well, I guess I wasn't one of those girls. I have to admit that instead of dreaming of ball gowns, I was dreaming of beaches. Instead of imagining rose bouquets, I was imagining orchid leis. See, I never really had that "fairytale" wedding in mind for myself. I was too busy dreaming of the perfect honeymoon...in Hawaii. What can I say? I'm obsessed with travel. That fact actually cemented my relationship with my now-husband: after college, we spent weeks backpacking around Europe, and have returned several times since then. In fact, he proposed to me in the dungeon of a castle in Scotland. Sounds creepy to some, but it was incredibly romantic to me! A year later, we walked down the aisle, and would have been ecstatic to walk right past the reception and onto the airplane to our planned honeymoon in Kauai and the big island of Hawaii. It had been a long year to say the least, complete with all of the family drama that weddings sometimes bring, plus the completion of one graduate degree (mine) and several job promotions (his). 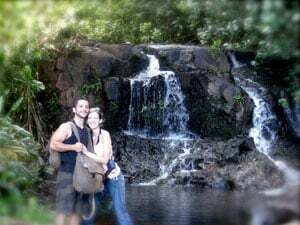 Luckily, we had bumped into Traveler's Joy during that time, and gained an added stress-relief factor by knowing that we were only paying about three-thousand dollars on an easily five-thousand dollar honeymoon. When we finally boarded the plane for the honeymoon on May 26, 2008, we were just happy to have survived the engagement and wedding. We honestly thought that we would be spending our nine days mostly relaxing on the beach with Mai-Tai in hand. We had not yet met Kauai! Kauai, the Garden Isle, greeted us with activities and adventures galore, and our traveler spirits could not resist the temptations. After horseback riding to crystal waterfalls, taking a catamaran tour of the NaPali Coast (the "island" in Jurassic Park), snorkeling within feet of sea turtles whose ages we can only hope to reach, attending an authentic luau, and stuffing ourselves on the island fare (all courtesy of our friends and family who utilized Traveler's Joy as our registry), we were exhilarated to be spending the first days of our marriage in one of the most beautiful places on earth. Our amazing bed-and-breakfast (Poipu Plantation Resort) greeted us warmly each night, and sent us out for more adventures after an amazing breakfast every morning. When we finally had to say goodbye to Kauai, we boarded a plane to the Big Island thinking that we might be on to the "beach bum" portion of our trip. Wrong. My siblings had actually purchased us the dolphin swim at our massive, outrageously fantastic hotel's (Hilton Waikoloa Village's) "Dolphin Quest" program, and we spent a day frolicking with the world's most amazing animal in a wonderful, educational facility. The next day, again thanks to our guests that utilized Traveler's Joy, we were able to take a volcano and waterfall helicopter tour with Blue Hawaiian Helicopters, and are still amazed to have seen lava flowing out and hitting the blue ocean, sending billows of steam into the air. These memories, however, would have been nothing without the "aloha" spirit that truly permeates these islands. My husband and I could not stop commenting on the friendliness of everyone we encountered: from our Poipu Plantation Resort manager, Javid, who sent us on a romantic sunset dinner on a deserted beach at the western-most point of Kauai; to the catamaran men whose love for the ocean was obvious; to the friendly dolphin trainers and wonderful helicopter pilot on the big island. Many of the people we encountered were implants from other parts of the United States, and it is absolutely obvious why they left the mainland for Hawaii. The islands are captivating, and even after all that we have seen in the world, did not fail to live up to my very own "fairytale" honeymoon dreams - which Traveler's Joy helped to make possible.